Do Good Bus, a program that provides transportation to mystery destinations where volunteers work on a project for a day. I volunteer whenever I can. With Do Good Bus, I have volunteered with Los Angeles Guerrilla Gardening, Orange County Food Bank, Trading Buckets, Foster the Future (a collaboration between Do Good Bus and the band Foster The People), Best Friends Animal Society Los Angeles, No Kill Los Angeles, Social Justice Learning Institute, TreePeople, Friends of Ballona Wetlands, and South Bay Wildlife Rehab. On my own, I’ve volunteered with Stray Cat Alliance, The Trevor Project, Human Rights Campaign, and NOH8 Campaign. This photo is from an event where we planted fruit trees—one for each of the lives that were lost in the shooting at Sandy Hook—at an elementary school. 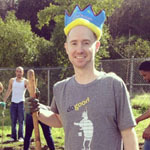 It was my birthday, so Rebecca Pontius from the Do Good Bus gave me a crown to wear. I plan to make volunteering on my birthday a tradition from now on. I volunteer with different people every time. You go with a big group and come back with a big group, so by the time you get to the event, you’re already friends and ready to help each other out. I volunteered because Do Good Bus sounded really fun and unique. I’ve spent my volunteering time doing so many different, amazing things. It’s a secret destination every time; all you know is it’s going to be something good. The first time I took “The Bus,” we went to an elementary school where we planted fruits and vegetables so that kids could grow their own healthy food to eat at school. I donate time. It’s a small sacrifice, and doesn’t feel like a task because you’re having fun and making friends. In return, I’ve gained an awareness of all the different ways you can help others. You always hear about the main ones, like Red Cross, but now I’ve learned about small organizations that are doing just as much. Now I have a lot of choices. Plus, you make a lot of memories that stay with you. 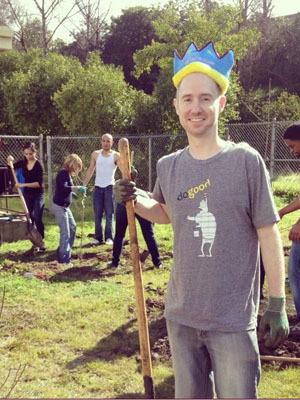 From one volunteer to another, just hop on the Do Good Bus! I hear so many people say, “I want to volunteer, but I don’t know where to go.” I tell people about Do Good Bus, but they don’t understand it until they actually get on the bus. It’s a really great way to learn to volunteer.